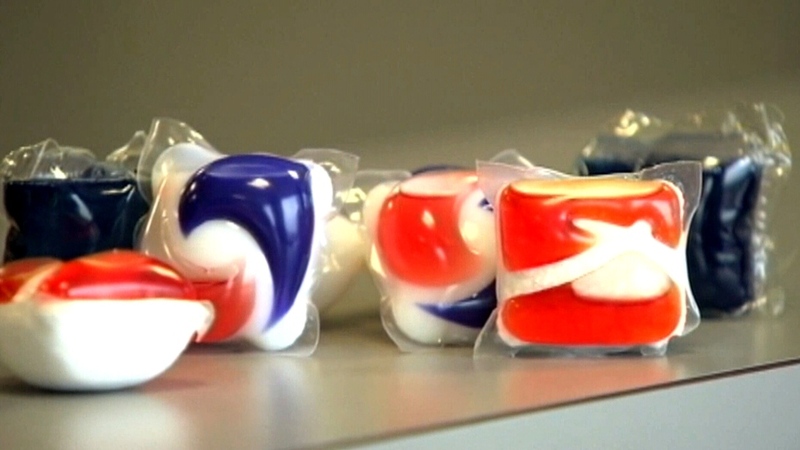 Canadian authorities are warning people to stop eating laundry detergent pods, a strange and dangerous online trend that has resulted in more than 40 hospitalizations in North America. In a statement issued Thursday, Health Canada warned teens and others from intentionally biting the pods, while a P.E.I. police force tried to make the same point with humour. An officer with Kensington police posted a video on the force's Facebook page describing the dangers of the so-called Tide pod challenge. In the seven-minute video, Const. Robb Hartlen reminds people that a banana and Timbit are safe to eat, but that a Tide pod or Timbit package are not. "Seriously, do we really need to tell people what they can and can't eat?" Hartlen said. The unlikely stunt has become an online phenomenon: People filming themselves biting into the colourful pod, and then becoming ill. Swallowing even a small amount of the highly concentrated detergent can cause diarrhea and vomiting. Both YouTube and Facebook have been working to take down the videos. According to an alert issued this week by the American Association of Poison Control Centers, the centres have received over 50,000 calls relating to liquid laundry packet exposures in the last five years. "While unintentional misuse by children five and under accounted for the majority of these calls, a recent trend among teenagers ingesting the packets -- and uploading videos to various Internet platforms including video-sharing websites, social media and vlogging platforms -- has caused significant concern among poison control centers," the alert reads. Poison control centres handled 39 cases of intentional exposure in 2016 and another 53 cases last year among 13- to 19-year-olds. "In the first 15 days of 2018 alone, centers have already handled 39 such intentional cases among the same age demographic. Ingestion accounted for 91 per cent of these reported exposures." Health Canada, which has been warning parents and caregivers about the dangers of detergent packs since 2013, said it has used social media to discourage the practice. "Health Canada is aware and concerned about social media accounts showing young people biting, eating or pretending to eat liquid laundry detergent packets. We remind Canadians that ingesting these packets can cause serious illness or death. Detergent products should never be put in anyone's mouth," it wrote in an email to The Canadian Press. Health Canada had no statistics for the number of Canadians sickened by the detergent packs. The Canadian Association of Poison Control Centres explained they don't have a national database for such information, but is in the process of developing one. Proctor and Gamble, which manufactures Tide, has also issued warnings. "What should Tide PODs be used for? DOING LAUNDRY. Nothing else. Eating a Tide POD is a BAD IDEA," the company wrote on its website. It enlisted Rob Gronkowski of the New England Patriots football team to be part of a social media video where he repeatedly says "no,no, no" to eating the detergent packs. "Use Tide Pods for washing, not eating," Gronkowski said in the video. Sitting in his P.E.I. police cruiser, Const. Hartlen said people tempted to do the pod challenge should instead bring back other, healthier online trends like the ALS ice-bucket challenge. He said if someone sees a person about to eat a pod, they should "feel free to give them an orange" instead. Tide pod detergent are seen in this image taken from video.